There’s an entire standup routine waiting to be written about how smart home accessories can be incredibly dumb and complicated. But one of the easiest smart home upgrades, smart lighting, has just gotten easy enough for even your parents to install without calling you—if they’re living in Apple’s ecosystem. A smart light bulb for those living in an all Apple world. Easy to install, and even easier to set up. Letting other people control the bulbs with their own iOS devices isn't as easy. 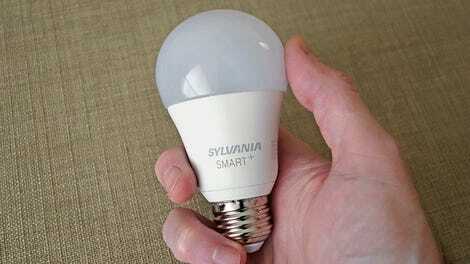 Smartphone-controlled light bulbs were one of the first smart home products that worked as promised, with minimal fuss. Philips’ Hue line, one of the first smart lighting systems available, uses bulbs that look and work just like standard incandescents, with the added convenience that you can remotely control them all from a mobile app. The only catch is that Philips’ system requires a wi-fi network in your home, a base station connected to your router, and yet another adapter squeezed onto your already crowded power bar. But there’s a much easier solution now, as long as you’ve completely bought into the Apple ecosystem. Installing Sylvania’s new Smart+ A19 full-color LED bulb is as easy as changing any of the bulbs in your house, because instead of talking to a base station, they talk directly to your iPhone or iPad using a built-in Bluetooth radio, and piggyback on the HomeKit smart home infrastructure Apple introduced to its mobile operating system a few years ago. Don’t worry, if you lose the instruction book, each bulb is tagged with its unique security code. Once the bulb is screwed into a socket and powered on, you connect your mobile device to it using the iOS Home app—which serves as Apple’s mostly user-friendly frontend for HomeKit. For security reasons you need to enter the bulb’s unique identifying code, which is as easy as pointing your smartphone’s camera at the instruction booklet, or manually entering the number which is also printed on the actual bulb—because who keeps track of where instruction manuals end up these days? Once connected you can use the iOS Home app to give the bulb a custom name, assign it to a room or a larger collection of smart home devices (like a single floor of a home), as well as turning it on or off, adjusting its brightness, or changing its color. 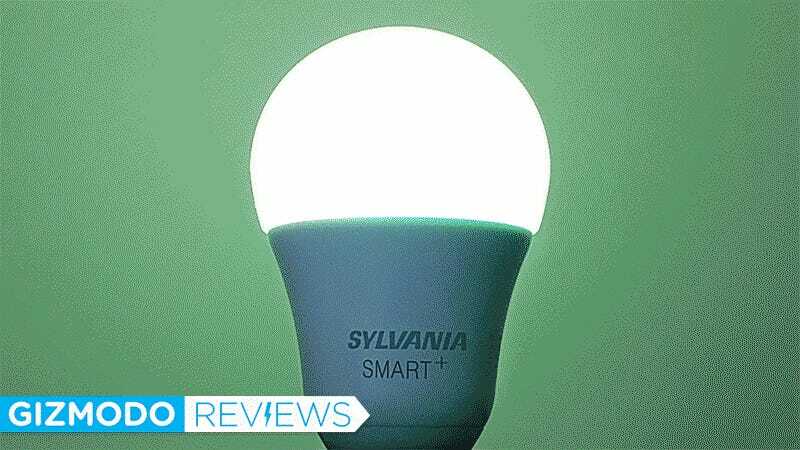 Just keep in mind that while Sylvania has positioned the Smart+ bulb as a legitimate 60-watt incandescent replacement, you’re only going to see the full 800 lumens of brightness (the same as a 60-watt bulb) when the bulb’s color temperature is set to as close as neutral white as possible. When tinted to deeper colors like red or blue, it becomes considerably dimmer. The iOS Home app offers very basic functionality for controlling your bulbs, but few will need more than what it has to offer. Piggybacking on Apple’s HomeKit and your iOS devices makes installing and setting up the Smart+ bulb easy, but it does have limitations. Your phone can connect to multiple bulbs using Bluetooth, but each bulb can only be connected to a single mobile device at a time. So you’ll have to use the Apple Home app’s invite feature to allow other people to control the bulbs synced to your device, and it’s not instantly obvious where this feature is hidden. When using the Philips’ Hue app, a simple tap on the hardware hub allows any device nearby to easily connect to the system. And because it’s designed as a jack-of-all-trades for controlling multiple types of smart home devices, the Home app isn’t as fully featured as dedicated bulb apps like those from Philips are. Changing the Smart+ bulb’s color through the Home app is rudimentary at best (there are no mood settings, or the ability to color match a photo) and while it’s fun to activate your lights using Siri and voice commands, this functionality also works with other smart bulbs, so it’s not a Sylvania exclusive. The use of Bluetooth, which only has a range of about 100 meters, also limits how far you can be while still controlling the Smart+ bulbs from your iPhone or iPad. Philips’ Hue system has a similar limitation as it uses a protocol called Zigbee to communicate with each bulb, but because its internet-connected base station acts as an intermediary between your device and the bulbs, you can easily control your lights while away from home. To do the same through HomeKit requires yo to have an Apple TV at home, or an iPad left behind, which serve as the bulb-controlling Bluetooth remote in your absence. Easy to install, easy to use, not-so easy to pay for. If your home is already kitted out with Apple gear, then Sylvania’s new Smart+ bulbs are easily one of the best options if you’re looking for an quick smart home lighting upgrade. Apple will undoubtedly continue to improve the Home app, and the minor hoops you have to jump through to let everyone else in your home control the lights are far from a deal breaker. What could be, however, is the price. You can get a dumb LED bulb, which will last for decades, for less than five bucks, but each Smart+ bulb will set you back $45—the same as a single bulb from Philips Hue. To upgrade all the bulbs in my living room alone would cost me $225, and to really take advantage of smart lighting you would want it in every room of your house. That’s a lot of money for an Apple fan to spend when a new iPhone is just around the corner. If everyone in your home is a dedicated Apple user, the Sylvania Smart+ is one of the easiest smart home accessories to set up and use. Android user? Move along, nothing to see here. 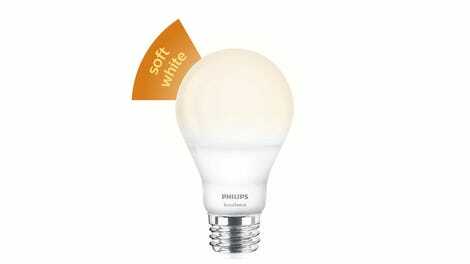 As bright as a 60-watt incandescent bulb, as long as you keep the color temperature as close to white as possible. At $45 per bulb it gets expensive to upgrade an entire house, even if they last for decades. Controlling or scheduling these bulbs while away from home requires a working Apple TV, or an iPad left behind.